Riffing on the simplest (and now one of the most recognizable) few note themes ever created for a movie, John Carpenter, along with Cody Carpenter and Daniel Davies, bring us their Halloween Original Motion Picture Soundtrack. Mainly you’ll hear what you know, that classic theme and the pumping low piano hits, backed up mostly with modern elements like extra percussion and more up-to-date synth bleeds. It’s when the tunes stray from the main theme that things get interesting. The piano-led “Allyson Discovered,” and pulsing low synth with the high string sound over the top of “Say Something,” work especially well. Even for stuff that is just soundscape color, the tunes don’t last too long. Though indeed, there are moments like “The Shape is Monumental,” a breathing-like synth over a low mournful one, and its follow-up “The Shape and Laurie Fight,” where I wanted more. This last piece, where the heroine and Michael face off, starts with some loud industrial bleats, flows into just low slow pulses, then we get a tickle of keys we have heard from Halloween before; another solid tune. 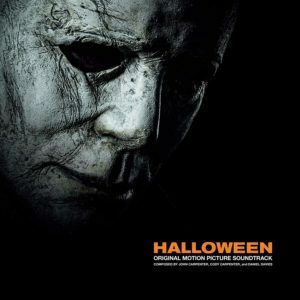 “Halloween Triumphant” is a pure update of the original movie’s main theme. It’s big, plodding, with lots of “shucky shuck” flybyes, and a wailing guitar lead that runs nearly eight minutes. I dug this last bit, it really sounds like a triumph and celebration of this franchise that, by all accounts, will end with this last movie.